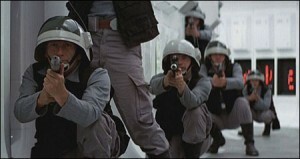 Rebel troopers (also known as Rebel soldiers and Rebel infantry) were standard foot soldiers employed by the Alliance to Restore the Republic. After the Declaration of a New Republic in 5 ABY, most Rebel troopers were organized into regular units of the New Republic Army. Can have white, smoke color or black “visor” . A comm pad on the helmet is required. Long-sleeve blue work shirt with bib in front (blue Chambray or blue Oxford recommended). Bib should cover front of shirt and it should come all the way up to the collar button and not sag. The bib can end in a range from below the belt line to approximately two to three inches above the belt line. No closures or buttons visible below the bib. No button down collars (with visible button holes on collar). Colour range from a light blue to medium blue (costume can be denied if shirt colour is deemed too dark blue). a) Vest can be the standard as purchased BDU shirt with 4 pocket layout on the front that you remove the collar and the sleeves. b) Screen accurate black vest should be made of a heavy duty black canvas/duck cloth fabric with a double stitched yoke line in the front and the back. The front of the vest should have: Right side one large pocket with 3 sections and each section should have a pocket flap and strap. Below the upper pocket is a smaller open pocket with a Velcro closure. Left side has one very large “half moon” pocket with two pockets on it. Top one is open and bottom one has a pocket flap. Below this large pocket is another pocket with a flap that is at the same height as the right side lower open pocket flap. 4. Light Grey or medium grey pants with large cargo pockets-must be BDU style pants and not modified jeans. Leather pull-on style preferred with low heels. No laces or ankle buckles. No non-black zippers. Any zipper closure must either be hidden or on the inside calf. No zippers on front or outside calf of boots. High-Calf boots are acceptable with sufficient blousing of the pants legs. Solid leather or vinyl – no holes or decorations. 2″ buckle can be rectangular, octagonal or oval. 3. Two (2) aluminium/silver belt boxes proportional to wearer. 4. Large open pocket on the upper back of the vest with a center Velcro closure. Proportional to wearer and should go almost from armhole to armhole. Pocket is located high on the back and start slightly higher than the mid point of the arm holes. 5. Strip of 3 pockets along the bottom hem of the vest approx. 5″ tall. 6. Antenna on helmet comm box. 8. Rank Badge – approx 2″ x 2″ (6CM), aluminium in color. Can only have blue and red pips (dots).